Christmas shopping is in full swing! And of course, when you're out spending your day shopping, many times that leads to eating out! Now, if the Christmas shopping isn't make a dent on your wallet, the food certainly can! Eating out can get rather pricey. 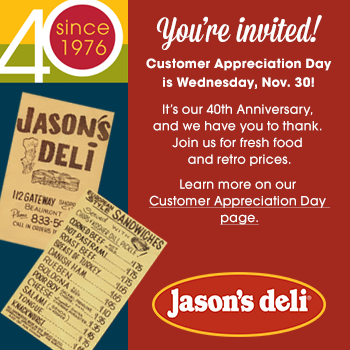 For the past 40 years, Jason's Deli has been serving delicious sandwiches that are perfect for eating out with the family without breaking the bank. All month long they've been celebrating with special offers and events, and it ends tomorrow, November 30 with a can't miss Customer Appreciation Day! Have you ever watched an old movie and thought to yourself... 'Man, what I wouldn't give to pay THOSE diner prices!"? I know I certainly have, and with this special celebration, now we CAN! Find out all the details about this event here. Then head on over to your local Jason's Deli to eat like its 1976! !